One last watercolor card this month to share with you. The idea with this one was to create a background to match the image. It is a fun approach and resulted in a unique card that mimics the glow of lightbulbs. It was made with brand new Hampton Art stamps and Jillibean Soup papers. The center mat is watercolor paper and using the clear stamp and an acrylic block I could map out where to paint the yellow paint for the bulb strands. Then I filled in the background with the sky blue color paint. That paper was then set aside to dry. Next I stamped the sentiment flags onto different patterned papers in black ink and fussy cut out. Once watercolor was dry I carefully aligned the lightbulb stamp in black ink over the yellow painted areas to create the glow effect. 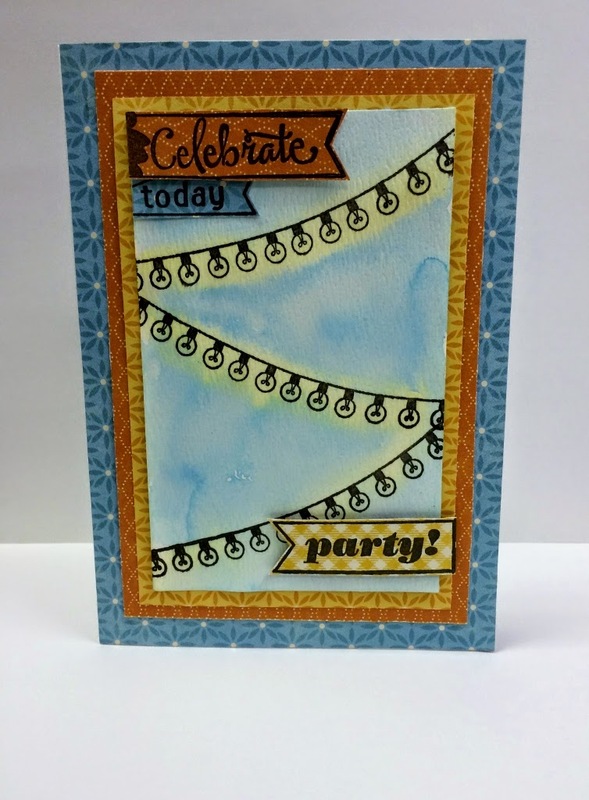 Then using Birthday Bisque papers I layered the yellow, orange and blue patterns as mats onto the card base. Last I added the sentiment flags as shown using 3D foam dots for the “Celebrate” and “party” flags. It really was a fun technique to try and could be used for any stamp in your stash. So celebrate today by giving this technique a try.